At first glance, she is clearly a Sun Odyssey. Moreover, the Sun Odyssey 439 reflects the design trend that started with the Sun Odyssey 409. Dynamic lines, a hard chine on the hull, lots of hatches and windows along with bevelled edges on the deck combine to form a powerful and straight forward design from the pen of Philippe Briand. But her natural beauty is more than skin deep. A closer look reveals an innovative deck plan that makes sailing easy. A Jeanneau is first, and foremost, for sailing. 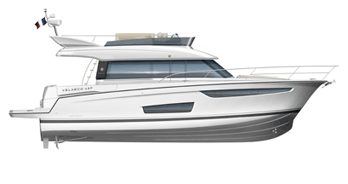 Three main concepts shape the Sun Odyssey 439: a fast, seaworthy sailboat, simple to use deck and sail plans and a high-quality interior.